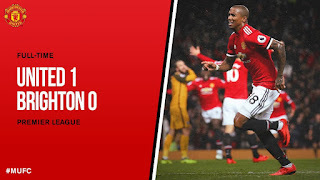 The Reds were frustrated for over an hour of the game, with the visitors stifling United's attempted attacking forrays, but Young's 25-yard effort hit Dunk and found its way into the far corner to secure a crucial three points. Jose Mourinho opted to start with the same starting XI that impressively dispatched Newcastle last week. The only changes from that outing saw Henrikh Mkhitaryan and Scott McTominay recalled to the matchday squad. The Reds played their part in the Stonewall UK's Rainbow Laces campaign by wearing colourful laces, while captain Antonio Valencia wore a rainbow-themed armband in support for LGBT inclusivity. And it was a bright start from United who had a chance to take an early lead but Romelu Lukaku fired over after neat play between him and Anthony Martial. Brighton on the other hand, arrived at Old Trafford unbeaten in five matches and as a current top-half team after a very steady start to the season. The lively Anthony Knockaert fired a dangerous ball across, which evaded everyone. Pascal Gross, who has scored three goals and provided five assists so far this season for the Seagulls, tried his luck from 20 yards, but David De Gea saved easily. The away side were frustrating United as the hailstones battered down and Chris Hughton's men looked dangerous on the counter attack and from set-plays. Glenn Murray failed to latch on to a dangerous in-swinging free kick before, just before half-time, the Reds' best chance fell to Lukaku who had a header saved by the feet of Matthew Ryan from a yard out, before the Australian keeper somehow kept out Paul Pogba's rebound. 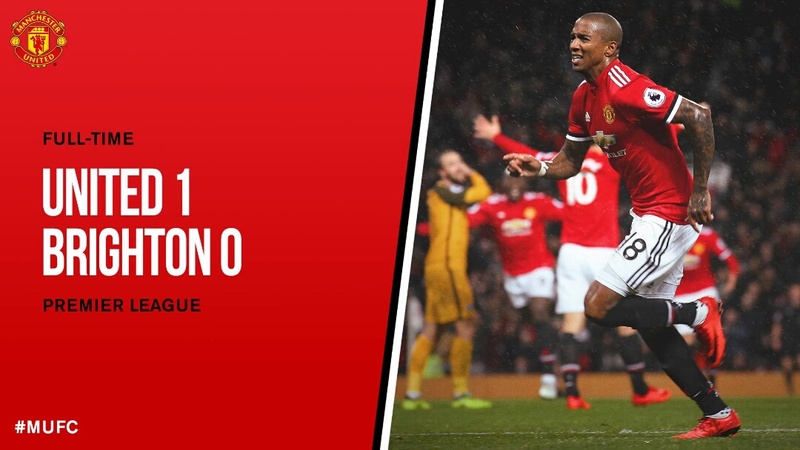 The second period came alive following a crunching, but fair, tackle by Victor Lindelof on Knockaert, which brought the Old Trafford faithful to life. The crowd were on their feet again for the emergence of Zlatan Ibrahimovic just past the hour mark and it didn't take long for that noise to inspire the Reds to take the lead - albeit in fortunate circumstances. A corner, disputed by the Seagulls when Lukaku fought to make a challenge, fell to Young and his left-footed effort from the edge of the box deflected off Dunk and looped over Ryan. Knockaert again fired one of his dangerous fizzing balls across the goal which evaded everyone, before Bruno Saltor did the same moments later as Brighton looked for a late leveller. Ibrahimovic almost wrapped it up after a move of real quality as he linked superbly with Lukaku and Pogba, but his volley fizzed off target. The result means United are now unbeaten in 38 home games in all competitions, since losing 2-1 to Manchester City in a Premier League match in September 2016. Next up at Old Trafford in the league? Manchester City, the current leaders. United: De Gea; Valencia (c), Lindelof, Smalling, Young; Matic, Pogba, Mata (Ibrahimovic 62), Rashford (Fellaini 79); Martial (Mkhitaryan 70), Lukaku. Subs not used: Romero, Rojo, Herrera, McTominay. Brighton: Ryan, Bruno (c), Duffy, Dunk, Bong, Knockaert, Stephens, Propper, March (Izquierdo 74), Groß (Brown 88), Murray (Hemed 74). Subs not used: Krul, Goldson, Schelotto, Kayal. The Reds travel to Vicarage Road on Tuesday 28 November to face a Watford side who are flying high in the top 10 of the Premier League with kick off at 20:00 GMT.